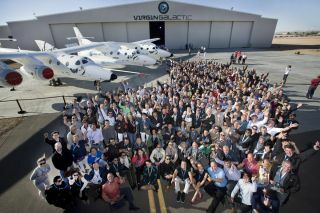 A number of Virgin Galactic's future astronauts gathered with Sir Richard Branson (center) for a group photo last year at Virgin Galactic's Final Assembly, Integration and Test Hangar (FAITH) in Mojave, Calif. Nearby is the WhiteKnightTwo mated with SpaceShipTwo. Virgin Galactic is reporting progress on creating the world's first commercial spaceline. But fitting all the elements together to handle high-velocity suborbital space travel has proved slow going. "In terms of the program, we're moving forward," said George Whitesides, CEO of Virgin Galactic. Closing in on nearly five years of test flying, with three powered flights under Virgin Galactic's wings, he said one thing that's clear, as any space industry person knows, is that there are more challenges than first thought. Virgin Galactic is a privately funded company, owned by adventurer and mogul Sir Richard Branson and his Virgin Group, along with Abu Dhabi's Aabar Investments PJS. The two-crew, six-passenger SpaceShipTwo (VSS Enterprise) and the carrier craft, WhiteKnightTwo (VMS Eve), used to release the rocket ship, have both been developed for Virgin Galactic's vehicle fleet by Mojave, California-based Scaled Composites. The VSS Enterprise and VMS Eve test flight program has been under way at Mojave's Air and Space Port since 2010, leading to Virgin Galactic commercial operations, which will be based at Spaceport America in New Mexico. Mixing up the medicine. New fuel grain for SpaceShipTwo’s hybrid rocket motor undergoes a recent test. Two puzzle pieces have recently been locked into position, according to Virgin Galactic. On May 23, the group declared its selection of a polyamide-based fuel grain to power its hybrid rocket motor for the remainder of the test flight program and the start of commercial operations. Whitesides said that Virgin Galactic has been developing two variants of the motor using two types of solid fuel grain: Hydroxyl-terminated polybutadiene, or HTPB, a type of rubber; and polyamide, a category of benign thermoplastic. Both fuel grains were designed to be interchangeable with the hybrid motor, and both have been tested extensively, he said. "We've been working on the plastic fuel grain from around 2008. We have gotten better performance characteristics. We've been working on both of these fuel grains for years," Whitesides said. Tests have shown that the plastic fuel grain "will enable a higher apogee" for SpaceShipTwo, he said. "It's the right one for us," Whitesides said, adding that the switch will require a little tweaking to the plumbing of SpaceShipTwo, "but it’s not a huge deal." In a May 29 statement, Virgin Galactic spotlighted the signing of a joint agreement with the Federal Aviation Administration (FAA). That agreement helps clear the path for commercial flights of SpaceShipTwo, Whitesides said. "It's another big piece of the puzzle in terms of getting ready to operate commercially from Spaceport America in New Mexico," Whitesides said. "It took some effort to negotiate over the months and years … so it's another milestone in terms of operational readiness," he said. Meanwhile, at New Mexico's Spaceport America, they are preparing for an increase in flight activity this calendar year, said Christine Anderson, executive director of the New Mexico Spaceport Authority (NMSA). "We are conducting operational contingency exercises each week to ensure we are well prepared. Our infrastructure is already in place," Anderson told Space.com. The "Spaceway" to handle departures and SpaceShipTwo landings, the emergency/fire/rescue facilities, and building structures are complete, she said. Anderson said that the "historic agreement" with the FAA Albuquerque Air Traffic Control Center and Virgin Galactic sets out parameters on how routine space missions launched from Spaceport America will be integrated into the National Airspace System. New Mexico's Spaceport America is home base for Virgin Galactic's suborbital spaceline. Whitesides sketched out the path ahead for shaking out SpaceShipTwo before stepping into commercial flight. To date, SpaceShipTwo has undergone a trio of short-duration, powered flights. So how many rocket-powered treks of the craft are on the books to hurl the vessel to the desired suborbital altitude? "I'm not going to give you a specific number," Whitesides said. "Let the test flight engineers govern how many flights we're going to do." Whitesides did note that he thought "we’ll be up to space" in maybe three to five or six flights, with a few more flights beyond that. Doing so would yield the needed data to press forward and also gain info on "customer climatization," he said. Just over 700 reservations are in hand from hungry-to-fly passengers, Whitesides said. The "up-and-going" price tag is now at $250,000 a seat. The suborbital journey will take voyagers to the edge of space, a little over 60 miles in altitude. Working with the Zero Gravity Corp., and its specially modified Boeing 727 — dubbed G-Force One — a mock SpaceShipTwo passenger cabin has been flown. The aircraft flies parabolic arcs that provide short stretches of microgravity. "We've got a lot of good data in terms of how to properly arrange people to get in and out of their seats…and how people move around during weightlessness," Whitesides said. In addition, he said that a "production version" of the passenger seat has been fabricated, with several now undergoing testing. "As we move through the rest of the flight test program, we will start installing those seats," Whitesides said, calling it another milestone leading up to commercial service. High-flying test program of WhiteKnightTwo/SpaceShipTwo launch system has been under way for nearly five years. The hope is that the next batch of flights will occur over the duration of this summer, Whitesides said. "I think we have a good shot at flying Richard this year and there's a logical pathway to that flight. We've got a lot of work to do to get to that point, but it's still in range, still a possibility," he said, with commercial service to start soon after Branson's space trek. Still, such a high-flying expectation is predicated on the test flight program, Whitesides said. Waiting in the wings is the on-going construction of another SpaceShipTwo, tagged SS2-02, Whitesides said. Similarly, the building of a second WhiteKnightTwo carrier plane is under way. Workers at Virgin Galactic's The Spaceship Company in Mojave are constructing the SS2-02. "By the midpoint of this year most of the big structural elements will be built and assembled," Whitesides said. "What I'm looking forward to is that moment where we can put the first spaceship nose-to-nose with the second spaceship. More work to do but we're getting closer. It will be an exciting moment for our team." Reflecting back over the years of test flying, Whitesides reiterated that "it's hard, but we're making progress." Having dozens, hundreds and thousands of people able to experience space via reusable, suborbital vehicles "is going to be critical," Whitesides said. "It's an important mind shift for humanity to go through."